Did You Miss the Live DNA Q&A? No Worries...Here's the Link to the Broadcast! Did you miss the Live DNA Q&A session on the Legacy Tree Genealogists Facebook page? Don't worry, we've got you covered! Here is the link to the broadcast in it's entirety. Enjoy! 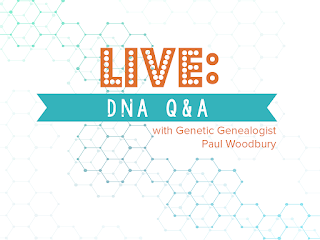 If you would like to submit a question for a future Live DNA Q&A session, you may do so at https://www.legacytree.com/live , or learn more about genetic genealogy at https://www.legacytree.com/genetic-genealogy-dna. You've Got Questions, We've Got Answers! Join Us for a FREE Live DNA Q&A Session Saturday, Oct. 29th! Have questions about genetic genealogy and how to find your ancestors using DNA? Join us TOMORROW! DNA Q&A on their Facebook page, with Sr. Genetic Genealogist, Paul Woodbury. Submit your genetic genealogy questions prior to the event at https://www.legacytree.com/live, then visit the Legacy Tree Genealogists Facebook page on October 29th at 10:30 a.m. MDT for the answers! We will also have an exclusive offer for everyone that attends the broadcast! The recording of today's webinar, "Flip for Flickr: Share, Store and Save Your Family Photos" by Maureen Taylor is now available to view for free for a limited time at www.FamilyTreeWebinars.com/BCG. Flickr offers users free storage and a way to protect your digital images with privacy settings. It's got everything a genealogist needs to collaborate with relatives on photo mysteries or to share family photos. It's an under-utilized resource. If you could not make it to the live event or just want to watch it again, the 1 hour 45 minute recording of "Flip for Flickr: Share, Store and Save Your Family Photos" PLUS the after-webinar party is now available to view in our webinar library for free for a limited time. Or watch it at your convenience with an annual or monthly webinar membership. Maureen A. Taylor, author of Uncovering Your Ancestry Through Family Photographs, provides all the information you need to care for your family photograph collection. She outlines in straightforward steps how to add value to your home collection by using the methods that conservators and photo curators use every day! 208 pages, 8"x10". Click here to purchase for $24.99. Civil Law Notaries - Using Notarial Records to Build a Family History by Melanie D. Holtz, CG. November 15. Hosted by the Board for Certification of Genealogists. The Illinois State Genealogical Society (ISGS) is happy to announce the continuation of its popular FREE monthly webinar program in 2017. The 2017 ISGS Webinar Series would not be possible without the generous contributions received throughout 2016 and the generous sponsorship provided by FamilySearch. Registration for the 2017 webinars is now open! You’ll find a fantastic lineup of presentations and speakers and we hope you will join us for a wonderful educational experience. So what does 2017 have in store? Here is our amazing lineup! November 14 – Illinois Gold: Hard to Find But Valuable Prairie State Resources for Genealogical Research Presenter: Thomas MacEntee Registration: Stay tuned! ** ** GoToWebinar only allows scheduling less than one year in advance. Check back after November 14, 2016, for the registration link. December 12 – Ephemera: Genealogy Gold Presenter: Sharon S. Atkins Registration: Stay tuned! ** ** GoToWebinar only allows scheduling less than one year in advance. Check back after December 12, 2015 for the registration link. Don't forget to spread the word! Forward this email onto your friends and colleagues, post the information to social media sites and/or your blog/website, or print out a few copies of our webinar flyer to hand out at your local society meetings. The flyer for the 2017 series can be accessed at http://bit.ly/isgs2017webinarbrochure. Again, a big thank-you to all of the webinar donation fund contributors and to FamilySearch for sponsoring the entire 2017 webinar series! We couldn't do it without you!! © 2016, copyright Illinois State Genealogical Society. All rights reserved. Presenter: Jill Morelli is a "Roots Generation" genealogist who pursues her passion for genealogy through lecturing, writing and research on topics inspired by her family. She blends scholarship, skill building, and story-telling to convey information that can be used immediately to answer genealogical questions of attendees whatever their skill level. Webinar Description: We know about the federal population schedules -- the decennial censuses are a mainstay for genealogists researching in the United States. But, did you know, that concurrent with the federal population schedules, the government also collected other types of data that are useful for today's genealogist to provide context of our ancestor's lives and for evidence? Five different non-population schedules -- agriculture, mortality, industry/manufacturing, community information and dependent, delinquent and deficient schedules -- will be reviewed illustrating how the information they contain can be used to answer genealogical questions. We will explore why these records were generated and why the extant records are so limited. And, finally, because it can be challenging, we will review the step-by-step methodology for accessing these records. Irrespective of its genealogical importance, some of the information found in these records is just fun! How many pounds of butter did your ancestor make in 1879? A recording of this webinar will be posted on the MnGS website, for members. Join us and Maureen Taylor for the live webinar Wednesday, October 26, 2016 at 2pm Eastern U.S. Register today to reserve your virtual seat. Registration is free but space is limited to the first 1,000 people to join that day. Before joining, please visit www.java.com to ensure you have the latest version of Java which our webinar software requires. When you join, if you receive a message that the webinar is full, you know we've reached the 1,000 limit, so we invite you to view the recording which should be published to the webinar archives within an hour or two of the event's conclusion. Maureen Taylor is an internationally recognized expert on the intersection of history, genealogy, and photography. She has been featured in top media outlets, including The View, Better Homes & Gardens, the Boston Globe, Martha Stewart Living, MSNBC, DIY: Scrapbooking, PBS Ancestors, Creative Memories' Lasting Moments, Dear Myrtle, and Satisfaction Magazine. Maureen is the author of a number of books and magazine articles, as well as a contributing editor at Family Tree Magazine. The Wall Street Journal calls Maureen "the nation's foremost historical photo detective. " Before she was the Photo Detective, Maureen was known for her expertise researching families in her home state of Rhode Island. The recording of today's webinar, "Social History Websites That Bring Your Ancestor's Story to Life" by Gena Philibert-Ortega is now available to view for free for a limited time at www.FamilyTreeWebinars.com/BCG. Social history is an important part of genealogical research. In this presentation we will go over 25 websites that will help you better understand your ancestor's life which will then lead you to more resources. If you could not make it to the live event or just want to watch it again, the 1 hour 23 minute recording of "Social History Websites That Bring Your Ancestor's Story to Life" is now available to view in our webinar library for free for a limited time. Or watch it at your convenience with an annual or monthly webinar membership. 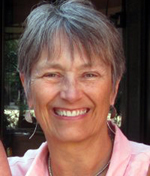 The recording of tonight's webinar, "Educational Preparation for Certification: Many Paths to the Same Goal" by Angela Packer McGhie, CG is now available to view for free for a limited time at www.FamilyTreeWebinars.com/BCG. If you could not make it to the live event or just want to watch it again, the 1 hour 14 minute recording of "Educational Preparation for Certification: Many Paths to the Same Goal" is now available to view in our webinar library for free for a limited time. Or watch it at your convenience with an annual or monthly webinar membership. Click here to purchase for 12.95. Last week's webinar, Midwestern Gems: Back Issues of Genealogical, Historical and Sociological Journals, presented by Paula Stuart-Warren, CG, FMGS, FUGA, is now available to ISGS members in the Members Section of the ISGS website (http://ilgensoc.org/members.php). 2017 ISGS Webinar SeriesStay tuned for an announcement later this week with a listing of all 12 webinars in our 2017 series! Join us and Gena Philibert-Ortega for the live webinar Wednesday, October 19, 2016 at 2pm Eastern U.S. Register today to reserve your virtual seat. Registration is free but space is limited to the first 1,000 people to join that day. Before joining, please visit www.java.com to ensure you have the latest version of Java which our webinar software requires. When you join, if you receive a message that the webinar is full, you know we've reached the 1,000 limit, so we invite you to view the recording which should be published to the webinar archives within an hour or two of the event's conclusion. You've Got Questions, We've Got Answers! Join Us for Our LIVE DNA Q:A! Have questions about genetic genealogy and how to find your ancestors using DNA? Submit your genetic genealogy questions prior to the event at https://www.legacytree.com/live, then visit the Legacy Tree Genealogists Facebook page on October 29th at 10:30 a.m. MDT for the answers!